When does the religious theme houses on the lens of photographer and together they travel the roads, streets away on the night of mystery and of indecipherable feelings? The subject may come from childhood, made ​​of ordinary prayers before bed, which may or may not have existed and installed in a curious ritual incorporated into nighttime, fulfilled in the time prior to sleep and dreams. The truth is in 1993 at age 23, recently graduated in law, Guy Veloso departs to Spain desiring to walk to Santiago de Compostela. In medieval route, followed by his steps, he takes his camera and, through the religious trail, registers settlements, simple living, crosses and roads where the sky meets the top of the old buildings, redesigning the images captured by eyes that went beyond the shot, providing the photographic act in a sensitive and insightful interpretation of the world. At that particular time in Spain was born the choice of a path that would be increasingly distant from the field of law and closer to the photography. In the strange sky invaded by ghostly clouds it’s possible to foresee the practically painting, future images steeped in mystery, performed in another setting, this time in Brazil. The analog camera is now back to the secret communities, often hooded, that hide suffered faces lost in villages in which small secular groups, surrounded by religious rituals, leave by the sound of truncheons , in night walks singing and praying for lost souls. How lost? Lost because of the sins? Because pain that turned into mourning and taken to the afterlife? What is more painful? The pain experienced in the forgotten lands or the perennial knockback never healed with the death? From the rituals come the imagistic narratives drawn from the penitents, but transformed into fiction by color, by light, or by the force of interpretive framework of the photographer who can establish a communication process with the one who sees the images and performs a new interpretation, according to their own experiences and aesthetic proposed by Veloso. 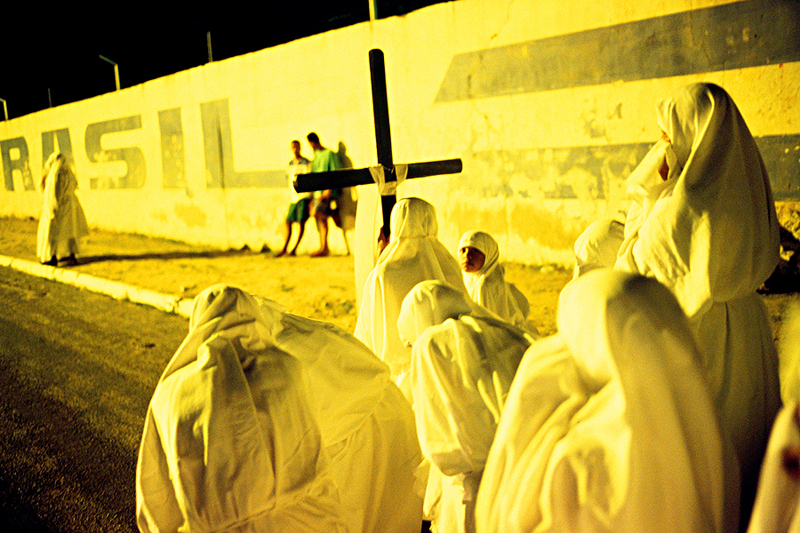 The project “Penitents: Blood Rituals of the fascination of the World’s End” opened in 2002, ten years of a painstaking work that generated an endless number of images obtained throughout Guy Veloso’s travels for all Brazilian regions. The mapping and the approach to the groups of penitents – which do not constitute a unison voice, but different arrangements of secular religion manifestation – require patience and the establishment of a network involving affection, respect and trust. The slow and gradual discovery of each group of penitents composed a sequence of files immersed in religious, historical, anthropological and sociological questions, but none of these issues, existing in the image, overlap with the specific issues of photography and art. As much as Guy Veloso is interested in gathering stories, chants, dresses and instruments used by the Soul Brothers, none of these attitudes overlaps the overview that endows the images with elements that concern the photograph itself or about art and the predominant aesthetics that differentiate them from others of simple documental character. One may ask how a photograph of Guy Veloso, that produces inventories that highlights facts of a Brazil often composed of neglect, pain, hunger and misery, enhancing those nouns, can become an intriguing picture, driven by color and light , look like a painting? It is known that “while the artist works by adding material on the screen, while brushstroke by brushstroke, he builds sets, the photographer works for subtraction, dismantles the continuity of the visible where draws his images“. Veloso uses, no doubt, the appeal from the subtraction, pulling to pieces the continuity of the scene, proposing a cutting-out to transform the “reality in a real photo”. When he crosses what he sees to an actual specific language of photography, the photographer is closer to the creative process than the documentary process, when punctuates the color and combine it with light, elects these two elements as fundamental choices to the aesthetic established and ends up assigning the value of art to the picture. Photography and art embedded in an extensive research reveal the religious axis of a subject that brings out the contradictions of a country that often leads its story by underground canals, forgotten before become well-known. Guy Veloso was born in Belem, a city in the Amazon region, which led to many legends and motivated imaginary to the construction of illusory images, sometimes closer to the adventure than reality itself. Among the many travelers and the construction of truths that pointed “lost paradises” stands out a vision perhaps more concrete, by Euclides da Cunha, who knew the Amazon rubber time as “a land without history”.” It was believed that this region was taken from the rest of the country and the precarious and unstable situation of the native was due, in addition to the wealth concentrated in few hands , the fact that the distance at which the Amazon stood in relation to the Brazilian states of increased market power. The contemporary world marked by diluted borders and globalizing processes promotes contacts between geographically remote locations and for this reason seems not to allow anymore isolation, since it shortens distances and times due to new technologies, according to new cartographies. However, Brazil is characterized by contrasting realities in which the highest technology coexists with rudimentary techniques, while wealth is opposed to a bewildering misery. Most of penitents are located in the restricted space of those who, living in a constant state of penury, apparently abdicate progress, depriving itself of wealth, believing that poverty is the good that will make them closer to God. Belief in what constitutes a palliative to the unbearable pain? Or impositions of a situation of famine due to a lack of a fairer economic and social policy, less unequal? Today as yesterday, public policies often do not fall into their designs practical measures which can address the social and economic difficulties – has always presented by a country of continental dimensions. In 1904, when it formed the Peru -Brazil Joint Commission for the Recognition of Alto Purus the goal was to demarcate the border between Brazil and Peru and these boundaries are related to the domain of a favorable economic situation, made possible by the extraction of rubber. However those who helped directly in the extraction process not only did not take part of the profits as well as worked like slaves. This was the opinion of Euclides da Cunha, who was appointed by the Baron of Rio Branco to lead the expedition, making a mapping, see the source of the river. The meeting with the Amazon was to the writer one more reason to grow his critical thinking and analysis on Brazil, a land made up of a geographical isolation, builder of painful stories. Most of the people who were worked in the rubber were from Northeast. Debt slavery is outlined in this human geography formed between North and Northeast regions in which the penitents, with their prayers and songs, have become more frequent. Forest, desert or wilderness? Where to place the Messianic idea to bring God’s comfort to the oppressed, to the Brothers of Soul? Tapper or backcountry? Who is the one who will lead the prayers and cover his face so that the secret get installed and help the forgiveness of sins? With the face uncovered, Antonio Conselheiro became a penitent pilgrim, incorporated the messiah, and was identified as the senseless enemy anti-republican. Without navigating the river Purus, he prayed, preached his sermons not in northern waters, but in the Northeast. Right in the backlands of Bahia became the leader of the battle of Canudos. Before the expedition that led him to the Amazon, Euclides da Cunha, in the late nineteenth century witnessed the fierce and unequal struggle between the Conselheiro’s group and Brazilian army. In his book “Os Sertões: Campanha de Canudos”, the author narrates the end of the war, gives us the sad dimension of unbelievable strength of miserable blessed before the army’s military action. Canudos never surrendered. Single example in all history, resisted until the complete depletion. Expunged inch by inch, literally talking, fell on October 5, at dusk, when its last defenders fell, they all died. There were only four: an old one, two men and a child in front of which five thousand soldiers roared angrily. At that moment the “World’s End” was here. 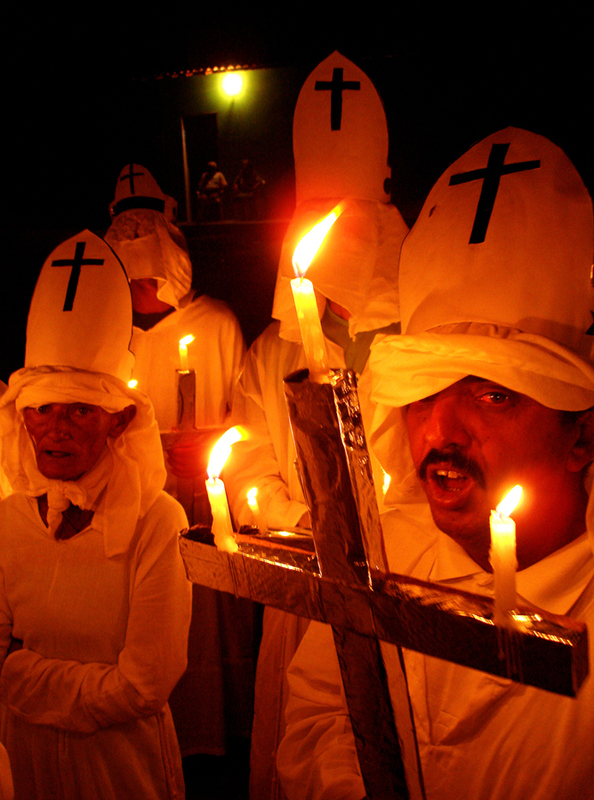 On Brazilian soil, the blood rites began or turned into unknown rituals without knowing if its origin dating from the persecution of Christians. The dry scene like a wilderness itself, left exposed not the vestiges dating back to the catacombs, the early Middle Ages, but the dry land that was in 1897 resembled the gaunt body of Antonio Conselheiro. “Photograph him after, and hewed to a strict record establishing his identity: matter that the country was well convinced that he was finally extinguished that terrible antagonist”. The ‘real’ got close to the ‘absurd’ and ambiguous stood on the threshold of fiction in the construction of a story whose writer’s imagination, artist or photographer could not attain. Guy Veloso visits the heirs of Conselheiro, yet the atmosphere of absurd, almost surreal, present in his photos, do not start from the nightmare that is set in the nineteenth century in the backlands of Bahia. More than one hundred years later, another reality is redesign, actually less warlike, but no less painful. Many protagonists are victims of drought, fanatics in their principles, follow the rigidity of the rules that shape their lives in pilgrimages and devotions. Responsible for softening the world’s sins, pray for the souls, help others, and are helped. Canudos’ Topography “modeled themselves before the imagination of those simple people as the first very extensive and high step into the heavens…”. In the 21st century there are still walkers in pilgrimage starting to climb the ladder that will reach the heaven. The 12 images selected to take part in the 29th Sao Paulo Biennial, held in 2010, which general curators were Agnaldo Farias and Moacir dos Anjos, it was possible to see that the theme with this wandering religious manifest in some Brazilian communities. The theme of the Biennale focused on the idea that art and politics are inseparable, since the world is guided by conflicts that generate power struggles and these disagreements are reflected in life, in art. The poetic and symbolic potential of Guy Veloso’s photographs comprehended himself with the curatorial thought, bringing the strength of a secular religious manifestation and interpretation of this very particular universe of penitents permeated by social, historical and political questions. The photographs chosen for the Biennale, which first were 16, also received the a curatorial support of Rosely Nakagawa, who joined the group of photos with the presence of suffering spirits, guided by strict principles that generate actions steeped in mystery, convoyed by bodies covered by many costumes sometimes created with robes or sheets. About the photos for the Biennial, two were held in 2002 and 2008 and the others in 2005. The scenes are impressive by the color, by the brightness, by the almost fictional landscape that mixes with strange characters. There is nothing that gets close to the surreal issue, but the image itself that subverts the reality and rewrites the fact, bringing it to the photographic field. Where does the night blue silhouette under the sheet which moves in an almost purple brown terrain that leads to heaven? Where does this character lost in prayer or shrouded in doubts that were spotted by a photographer? Where did the white figure resting on top of the wall, hidden in shade, highlighted in yellow that illuminates the building in the background? They are Senhora da Gloria de Laranjeiras’ penitents, in Sergipe, they are elements that have broken off from somewhere and ghostly inhabit ambiguous narratives that stir imagination and release an aesthetic that promote light and planes. Veloso says he always liked religiosity, metaphysical and esoteric demands to study. The mastery of technique, the concentration in the photographic act brings out the fragment of reality that becomes virtual. What was seen gains a special light that transcends reality, the painting in light follows the will of the photographer that overlaps with the machine and invades the land of the sensitive, giving new meaning to the captured image. Without losing the strength of the violent gestures of the penitent, Guy Veloso makes the flogging does not become explicit because of the color and the red spots that dot the blurred bodies amid the road. No one knows where the green path will take the photographed, nor the viewer, there triumphs the mystery, fear. Indecipherable shapes, trembling wings angels, night pictures populated by masked heads and closed eyes bring the non-submission to the normative rationality governing the alleged reality. “Between the real and the image always stands an infinite series of other images, invisible, but operative, which constitute visual, in iconic prescriptions, in aesthetic arrangements.” Guy Veloso’s photographs are located in this universe in which stand unseen images and aesthetics he proposed can be recognized. The strange imagery created by Veloso is done in the opposite of reality, but which reality permeates the context in which the penitents are? The surreal is often settled in their own lives and the crossing with the Brothers of Soul takes the unimaginable scene that the mind recreates and eye witness. Another way to name the penitent. Information provided by Guy Veloso. Although Veloso has a huge experience in P&B photos, this is about color photos, once the issue is the 16 photos sent to the 29º Biannual of São Paulo, more specifically the 12 selected. This except was taken from Rouillé, André. A fotografia: entre documento e arte contemporânea. São Paulo: Editora Senac São Paulo, 2009, pp. 101-102. This is about the 1st chapter of the book organized by Tenório Telles, which author is Cunha, Euclides. Amazônia: a lost paradise. Manaus: Editora Valer, 2011. This text is the part IV of the last chapter, Últimos Dias, of the book by Cunha, Euclides Rodrigues Pimenta da. Os Sertões: campanha de Canudos. 27th edition. Brasília: Publisher Universidade de Brasília, 1963, p. 463. Em que momento o tema religioso abriga-se na lente do fotógrafo e juntos percorrem estradas, ruelas distantes em noites de mistério e de indecifráveis sentimentos? O tema talvez provenha da infância, das rezas corriqueiras feitas antes de dormir, que podem ou não ter existido e se instalado na curiosidade de um ritual incorporado ao hábito noturno, cumprido no tempo que antecede ao sono e aos sonhos. O certo é que em 1993 aos 23 anos, recém-formado em Direito, Guy Veloso parte rumo à Espanha com o desejo de caminhar até Santiago de Compostela. Na rota medieval, seguida por seus passos, leva a câmera fotográfica e pela trilha religiosa vai registrando povoados, singelos moradores, cruzes e estradas nas quais o céu encontra-se com o topo dos antigos prédios, redesenhando as imagens captadas por olhos que iam além do documento, dotando o ato fotográfico de uma sensível e perspicaz interpretação do mundo. Naqueles instantes de Espanha nascia a opção por uma trajetória que o deixaria cada vez mais distante do campo do Direito e mais próximo da fotografia. No estranho céu invadido por fantasmagóricas nuvens já se antever a quase pintura, as futuras imagens impregnadas de mistérios, realizadas em outro cenário, desta vez no Brasil. A câmera analógica volta-se agora para as comunidades secretas, muitas vezes encapuzadas que encobrem as faces sofridas, perdidas em lugarejos nos quais os pequenos grupos laicos, envoltos em rituais religiosos, saem ao som das matracas, em caminhadas noturnas a cantar e rezar pelas almas perdidas. Perdidas de que? De pecados que carregaram em vida? De dores que se transformaram em lamentos e foram levados para além-túmulo? O que mais dilacera: a dor vivida nas terras esquecidas ou o eterno golpe jamais cicatrizado com a morte? Dos ritos advêm as narrativas imagéticas retiradas dos penitentes, mas transformadas em ficção pela cor, pela luz, pelo enquadramento ou pela força interpretativa do fotógrafo que consegue estabelecer um processo comunicativo com aquele que vê as imagens e realiza nova interpretação, segundo suas próprias vivências e a estética proposta por Veloso. O projeto Penitentes: dos Ritos de Sangue à Fascinação do Fim do Mundo tem início em 2002, são dez anos de um trabalho minucioso que gerou infinitas imagens conseguidas nas inúmeras locomoções de Guy Veloso por todas as regiões brasileiras. O mapeamento e a aproximação do fotógrafo com os grupos de penitentes – que não representam uma uníssona voz, mas diferentes formas de manifestação laica religiosa – exigem paciência e a constituição de uma rede de amizade que envolve relações de afetividade, respeito e confiança. A lenta e gradativa descoberta de cada grupo de penitentes compôs uma série de arquivos perpassados por questões religiosas, históricas, antropológicas e sociológicas, todavia nenhuma dessas questões, presentes na imagem, se sobrepõem às questões específicas da fotografia e da arte. Por mais que Guy Veloso se interesse em recolher narrativas, cantos, paramentos e instrumentos utilizados pelos Irmãos das Almas, nenhuma dessas atitudes se sobrepõe ao olhar que dota as imagens de elementos que concernem à própria fotografia ou diz respeito à arte e à estética predominante que as distinguem de outras de caráter apenas documental. Pode-se perguntar como em Guy Veloso uma fotografia produtora de inventários que destacam fatos de um Brasil muitas vezes composto por descaso, dores, fome e miséria pode, sem esquecer esses substantivos, transformar-se em uma fotografia instigante, impulsionada pela cor e luz, aproximando-se da pintura? Sabe-se que “enquanto o pintor trabalha por adição de matéria sobre a tela, enquanto, pincelada por pincelada, ele constrói conjuntos, o fotógrafo trabalha por subtração, desmantela a continuidade do visível de onde extrai suas imagens”. Veloso utiliza sem dúvida o recurso da subtração, desmontando a continuidade da cena, propondo o seu recorte para transformar o “real em um real fotográfico”. Ao transpor o que testemunha para um real específico da linguagem da fotografia, o fotógrafo aproxima-se mais do processo criativo do que do documental, ao pontuar a cor e combiná-la com a luz, elege esses dois elementos como escolhas fundamentais à estética que se impõe e termina por atribuir à imagem o valor de arte. Fotografia e arte imbricadas em uma longa pesquisa revelam o eixo religioso de um tema que traz à tona as contradições de um país que muitas vezes conduz sua história por subterrâneos canais, esquecida antes de se fazer conhecer. Guy Veloso nasceu em Belém do Pará, cidade situada em plena Amazônia, região que propiciou inúmeras lendas, motivou imaginários na formação de imagens ilusórias, às vezes mais próximas da aventura do que da própria realidade. Entre os muitos viajantes e as construções de verdades que apontavam “paraísos perdidos” destaca-se uma visão talvez mais concreta, apresentada por Euclides da Cunha que percebeu a Amazônia da época da borracha como “uma terra sem história”. Acreditava que esta região encontrava-se sequestrada do resto do país e que a situação precária e instável do seringueiro devia-se, além da riqueza concentrada nas mãos de poucos, ao fato da distância na qual a Amazônia se situava em relação aos estados brasileiros de maior poder econômico. O mundo contemporâneo demarcado por diluídas fronteiras e processos globalizantes promove contatos entre localidades geograficamente longínquas e por esta razão parece não mais permitir o isolamento, uma vez que encurta distâncias e tempos em função das novas tecnologias, em função de novas cartografias. Contudo, o Brasil caracteriza-se por contrastantes realidades em que a mais alta tecnologia convive com técnicas rudimentares, enquanto a riqueza se contrapõe a uma miséria desconcertante. A maioria dos penitentes localiza-se no espaço restrito daqueles que, por viverem em estado constante de penúria, aparentemente abdicam do progresso, destituindo-se da riqueza, por acreditarem que a pobreza é o bem que os tornará mais próximo de Deus. Crença no que se constitui um paliativo para o insuportável da dor? Ou imposições de um estado de carestia decorrente da falta de uma política econômica e social mais justa, menos desigual? Hoje como ontem as políticas públicas muitas vezes não inserem em seus projetos medidas práticas que possam sanar as dificuldades econômicas e sociais – desde sempre apresentadas por um país de dimensões continentais. Em 1904, quando se formou aComissão Mista Brasileiro-Peruana de Reconhecimento do Alto Purus o objetivo era demarcar a fronteira entre o Brasil e o Peru e estas delimitações estariam relacionadas com o domínio de uma situação econômica favorável, possibilitada pela extração da borracha. No entanto aqueles que ajudavam diretamente no processo de extração não só não participavam dos lucros como também trabalhavam para escravizar-se. Esta era a opinião de Euclides da Cunha que foi designado pelo Barão do Rio Branco para chefiar a expedição, fazer um levantamento cartográfico, observar a nascente do rio. O encontro com a Amazônia foi para o escritor mais um motivo para desenvolver a sua análise e pensamento crítico sobre o Brasil, terra constituída por uma geografia de isolamento, construtora de histórias sofridas. A maioria dos que trabalhavam nos seringais eram nordestinos. A escravidão por dívida delineava-se nessa geografia humana formada entre Norte e Nordeste, regiões nas quais os penitentes, com suas rezas e cânticos, tornaram-se mais presentes. Floresta, deserto ou sertão? Onde situar a ideia messiânica de levar o conforto de Deus aos oprimidos, aos Irmãos das Almas? Seringueiro ou sertanejo? Qual aquele que guiará as orações e cobrirá seu rosto para que o secreto se instale e ajude na remissão dos pecados? Sem o rosto coberto, Antônio Conselheiro se fez penitente e peregrino, incorporando o messias errante, identificado como o louco inimigo antirrepublicano. Sem navegar pelo rio Purus, fez suas preces, pregou seus sermões não em águas do Norte, mas em terras nordestinas. Em pleno sertão da Bahia tornou-se líder do arraial de Canudos. Antes da expedição que o levou até a Amazônia, Euclides da Cunha, ainda no final do século XIX, testemunhou a luta acirrada e desigual entre o grupo de Conselheiro e o exército brasileiro. Em seu livro Os Sertões: campanha de Canudos, o autor narra o final da Guerra, dá-nos a triste dimensão da inacreditável resistência de miseráveis beatos diante da ação bélica do exército. Canudos não se rendeu. Exemplo único em toda a História, resistiu até ao esgotamento completo. Expugnado palmo a palmo, na precisão integral do termo, caiu no dia 5, ao entardecer, quando caíram os seus últimos defensores, que todos morreram. Eram quatro apenas: um velho, dois homens feitos e uma criança, na frente dos quais rugiam raivosamente cinco mil soldados. Naquele instante o “Fim do Mundo” era aqui. Em terras brasileiras, os ritos de sangue começaram ou seguiram em seitas sem se saber se sua origem datava das perseguições aos cristãos. A cena árida como o próprio sertão, deixava expostos não os vestígios que remontam às catacumbas, ao início da Idade Média, mas a terra seca que em 1897 mimetizou-se ao corpo esquálido de Antônio Conselheiro. “Fotografaram-no depois, E lavrou-se uma ata rigorosa firmando sua identidade: importava que o país se convencesse bem de que estava afinal extinto aquele terribilíssimo antagonista”. O real aproximou-se do absurdo e ambíguo situou-se no limiar da ficção, na construção de uma história cuja imaginação do escritor, artista ou fotógrafo já não podia alcançar. Guy Veloso visita os herdeiros de Conselheiro, contudo o clima de absurdo, quase surreal, presente em suas fotos, não partem do pesadelo que se configurou no século XIX no sertão da Bahia. Mais de cem anos depois, redesenha-se outra realidade, menos bélica, mas não menos sofrida. Muitos protagonistas são vítimas da seca, fanáticos em seus princípios, seguem a rigidez das normas que formatam suas vidas em peregrinações e devoções. Responsáveis por amenizar o pecado do mundo, rezam pelas almas, procuram ajudar o próximo, serem ajudados. A topografia de Canudos “modelava-se ante a imaginação daquelas gentes simples como o primeiro degrau amplíssimo e alto, para os céus…” Em pleno século XXI errantes continuam partindo em romaria para galgar os degraus que os farão alcançar os céus. Nas 12 imagens selecionadas para participar da 29ª Bienal de São Paulo, realizada em 2010 com curadoria geral de Agnaldo Farias e Moacir dos Anjos, o tema afinava-se com essa errância religiosa manifesta em algumas comunidades brasileiras. A temática da Bienal concentrava-se na ideia de que arte e política são inseparáveis, uma vez que o mundo norteia-se por conflitos que geram disputas de poder e essas disputas refletem-se na vida, na arte. A potencialidade simbólica e poética das fotografias de Guy Veloso coadunava-se com o pensamento curatorial, trazendo ao mesmo tempo a força de uma manifestação laica religiosa e a interpretação muito particular desse universo de penitentes permeado por questões sociais, históricas e políticas. As fotografias da Bienal, que primeiramente eram 16, também receberam o apoio curatorial de Rosely Nakagawa, que uniu o conjunto de fotos com a presença desses espíritos sofredores, guiados por preceitos rígidos que geram ações impregnadas de mistério, acompanhadas por corpos cobertos por indumentárias muitas vezes criadas com mantos ou lençóis. Das fotos destinadas à Bienal, duas foram realizadas em 2002 e 2008 e as demais em 2005. As cenas impressionam pela cor, pela luminosidade, pela paisagem quase ficcional que se integra às estranhas personagens. Não é o acaso que se inscreve na proximidade com a questão surreal, mas a imagem em si que subverte a realidade e reescreve o fato, trazendo-o para o campo fotográfico. De onde vem o azul noturno da silhueta sob o lençol que se movimenta em um terreno marrom quase púrpura que conduz ao céu? De onde vem essa personagem perdida em rezas ou envolta em dúvidas que foi flagrada pelo fotógrafo? De onde surgiu a figura branca pousada no topo do muro, escondida em máscara, destacada no amarelo que ilumina o prédio ao fundo? São penitentes de Senhora da Glória e de Laranjeiras, em Sergipe, são figuras que se desprenderam de algum lugar e fantasmagóricas habitam ambíguas narrativas que atiçam imaginários e provem estéticas que promovem luz e planos. Penitentes. Nossa Senhora da Glória-SE. Veloso revela que sempre gostou do tema da religiosidade e que estudar questões metafísicas, esotéricas é de sua predileção. O domínio da técnica, a concentração no ato fotográfico traz à tona o fragmento do real que se virtualiza. O que foi visto ganha uma luminosidade específica que transcende a própria realidade, a pintura em luz segue a vontade do fotógrafo que se sobrepõe à máquina e invade o terreno do sensível, dando novo significado a imagem captada. Sem perder a força da violenta gestualidade do penitente, Guy Veloso faz com que o autoflagelo não se torne explícito devido à cor, às manchas vermelhas que pontuam os corpos desfocados em meio à estrada. Não se sabe para onde o caminho em verde vai levar o fotografado, nem o espectador, ali prevalece o mistério, o medo. Formas indecifráveis, anjo de asas tremulas, noturnas imagens povoadas por cabeças encobertas, por olhos em frestas trazem a não submissão à racionalidade normativa que rege a pretensa realidade. “Entre o real e a imagem sempre se interpõe uma série infinita de outras imagens, invisíveis, porém operantes, que se constituem em ordem visual, em prescrições icônicas, em esquemas estéticos”. As fotografias de Guy Veloso situam-se nesse universo no qual se interpõe invisíveis imagens e a estética por ele proposta se faz reconhecer. O absurdo imagético criado por Veloso se faz na contramão da realidade, mas qual realidade permeia o contexto em que os penitentes se encontram? O surreal muitas vezes localiza-se na própria vida e a travessia com os Irmãos das Almas se dá na inimaginável cena que os olhos presenciam e a mente recria. Outro nome dado aos penitentes. Informação fornecida por Guy Veloso. Apesar de Veloso possuir vasta experiência com fotografias em branco e preto, estarei referindo-me às fotos em cor, pois o objeto aqui abordado são as 16 fotografias selecionadas para 29ª Bienal de São Paulo e mais especificamente as 12 expostas. Este trecho foi extraído de Rouillé, André. A fotografia: entre documento e arte contemporânea. São Paulo: Editora Senac São Paulo, 2009, pp. 101-102. Trata-se do 1º capítulo do livro organizado por Tenório Telles, de autoria de Cunha, Euclides. Amazônia: um paraíso perdido. Manaus: Editora Valer, 2011. Este texto integra VI parte do último capítulo, Últimos Dias, do livro de autoria de Cunha, Euclides Rodrigues Pimenta da. Os Sertões: campanha de Canudos. 27ª edição. Brasília: Editora Universidade de Brasília, 1963, p. 463.